Derrick Barry performs at Big Apple Circus for Derrick Barry Presents ‘Britney’s Circus: The 10th Anniversary’ at Lincoln Center Darmosch Park. Barry, who’s known for starring on ‘RuPaul’s Drag Race,’ is also the ultimate Spears impersonator. He was the Guest Ringmaster for the ‘Britney’s Circus: The 10th Anniversary’ celebration, which was only presented at The Big Apple Circus. 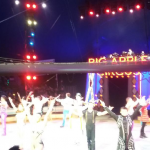 Barry took over Lincoln Center to mark the 10-year release date of Spears’s iconic ‘Circus’ album, and the anniversary of the singer-dancer performing with the Big Apple Circus ensemble. 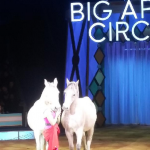 Guests were treated to a powerful, memorable and stunning tribute to not only the iconic pop record, but also a hypnotizing recognition of the Big Apple Circus. ‘Britney’s Circus: The 10th Anniversary’ began with a riveting performance by Barry, as he danced to Spears’s hit uptempo electropop-dance title song from her sixth studio album. 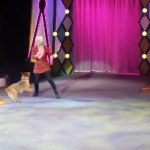 The show then delved radiant and sensational presentations, tricks and appearances by clowns Adam Kuchler and Mark Gindick; animal trainer Jenny Vidbel with horses and dogs; the four-man trampoline crew, Spicy Circus; and a contortionist group, the Virginia and Ihosvanys Duo Fusion. 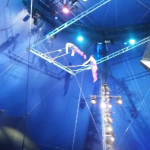 The Big Apple Circus ended on a high note with an electrifying routine by a flying trapeze troop. The group gave an amazing, high-energy show that was driven by their signature backflips and somersaults. Following the riveting finale of the ‘Britney’s Circus: The 10th Anniversary’ presentation, Barry participated in a meet and greet with audience members in the Mirror Room. Fans were able to take pictures with the impersonator, who perfectly captured the Grammy Award-winning singer’s look and mannerisms. The meet and greet was exhilaratingly brought to life by DJ Ty Sunderland, who played Spears’s greatest hits. 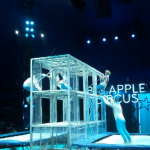 The Big Apple Circus’ decade celebration of Spear’s hit festival-themed album was a surprising and entertaining family-friendly event that allured audiences of all ages into the center of the ring. Check out photos from Derrick Barry presents ‘Britney’s Circus: The 10th Anniversary’ below. 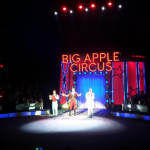 (L-R): Clown Mark Gindick, ringmaster Stephanie Monseu and clown Adam Kuchler perform at Big Apple Circus for Derrick Barry Presents ‘Britney’s Circus: The 10th Anniversary’ at Lincoln Center Darmosch Park. 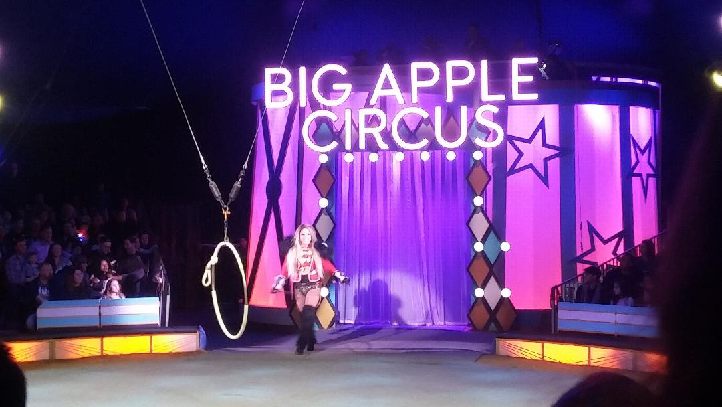 Jenny Vidbel performs at Big Apple Circus for Derrick Barry Presents ‘Britney’s Circus: The 10th Anniversary’ at Lincoln Center Darmosch Park. 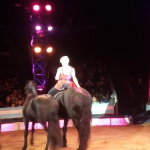 Horses at Big Apple Circus for Derrick Barry Presents ‘Britney’s Circus: The 10th Anniversary’ at Lincoln Center Darmosch Park. Spicy Circus performs at Big Apple Circus for Derrick Barry Presents Britney’s Circus: The 10th Anniversary at Lincoln Center Darmosch Park. Virginia and Ihosvanys Duo Fusion performs at Big Apple Circus for Derrick Barry Presents ‘Britney’s Circus: The 10th Anniversary’ at Lincoln Center Darmosch Park. The Flying Tuniziani performs at Big Apply Circus for Derrick Barry Presents ‘Britney’s Circus: The 10th Anniversary’ at Lincoln Center Darmosch Park. Grand finale at Big Apple Circus for Derrick Barry Presents ‘Britney’s Circus: The 10th Anniversary’ at Lincoln Center Darmosch Park. Derrick Barry impersonates Britney Spears at the meet and greet following the Big Apply Circus for Derrick Barry Presents ‘Britney’s Circus: The 10th Anniversary’ at Lincoln Center Darmosch Park. Derrick Barry, who's known for starring on 'RuPaul's Drag Race' and being the ultimate Britney Spears impersonator, was the Guest Ringmaster for the 'Britney's Circus: The 10th Anniversary' celebration, which was only presented at The Big Apple Circus at the Mirror Room at Lincoln Center.